Today my heart hearts, friends. As I shared on Instagram today, two Iowa police officers were shot & killed in two separate ambush style attacks overnight. Many of you know that my Dad, who also quilts with me, is a retired Iowa officer & it all hits too close to home. Once police family, always police family. I've cried tears, I've prayed, and now I'm doing what I do best -- making quilts for the families left behind. Several of you have reached out asking how you can help (thank you, thank you, THANK YOU!) -- take a look below for all the details. HOW CAN I HELP? MAKE A BLOCK. 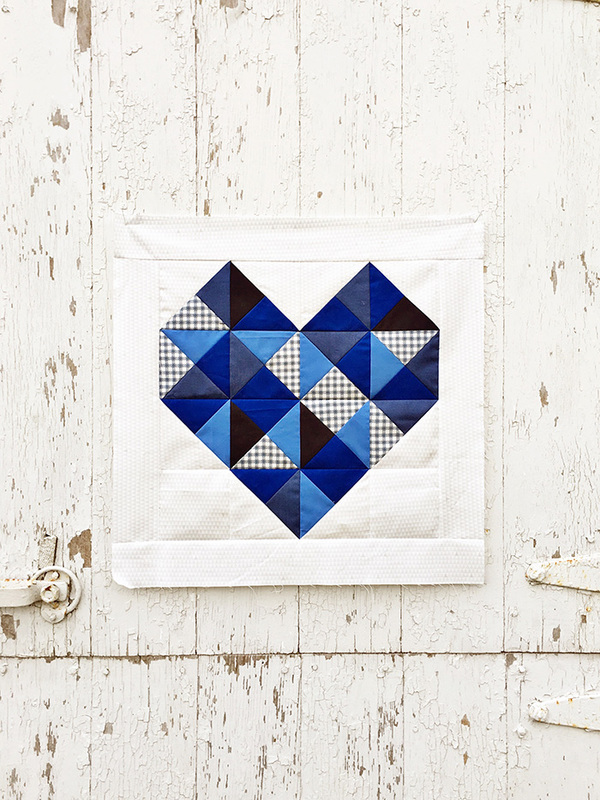 We'll be using my FREE Patchwork Heart pattern as our block design -- you can find it here. Please use a scrappy selection of royal blue fabrics (prints & solids) for the heart and one white or gray fabric (print or solid) for the background. Each block should measure 18" finished (18 1/2" unfinished). When you are ready to send your blocks, please e-mail me at megan@canoeridgecreations.com for shipping information. HOW MANY BLOCKS DO YOU NEED? As many as your heart desires. Did you know there have been 51 policed officers killed in the US this year alone? In senseless, violent attacks just like this one. We'll put together as many Blue Heart Quilts as we have blocks for, starting with these two Iowa officers. I DON'T SEW OR DON'T HAVE TIME TO MAKE A BLOCK NOW, HOW ELSE CAN I HELP? Feel free to e-mail me at megan@canoeridgecreations.com for more information. Do you want just the pieced block? Or should it be pieced and quilted, and not bound? Sorry, kind of new but want to contribute. Great question, Joy. Just the block please -- I'll put them together into throw sizes quilts as they come in. THANK YOU! Megan, I'd love to help but don't quilt. Please let me know what I can do!! Bless you!! Thank you for doing this!! I want to help but a whole quilt is daunting. I can do a block or two! I'll email you as soon as they are done. PS I work in Urbandale, Iowa, it is awful. I've driven by the memorials for the officers on the street. I can't help but burst into tears when I see it or read about it. Thanks again Megan. I too am affected in the police family....my son is an officer in Memphis, Tennessee. Every time an officer is killed I didn't know what I could do to help. Now I do!! Megan, I plan to make a block. Thank you for heading this up! So sorry for this awful news. Sending prayers for all involved. I hope to be able to contribute in the future. Great idea and I am sure the families will be so appreciative! Thank you so much for doing this! I will be making and sending blocks, I love the men and women who put their lives on the line every single day - so I can be safe. God Bless you and God bless the police. So sad for all the families left behind. I can't even imaging the pain. I'll be sending at least one block. What a nice thing to do Megan. My heart goes out to all the law enforcement officers and their families. What a wonderful idea! Thank you for doing this. I am backed up with my holiday sewing (and soon baking) will it be too late if I send something in January? We also lost an officer, in an ambush type setting. Makes me so sad...and mad. A young family man gone for no reason. I will see what I have for quilt blocks. i love the idea of making and gifting quilts to those who could use it most right now. emailed you already - I have 2 blocks ready to go. thanks! Megan, I love that you're doing this! My husband is a police officer, so this issue is very close to my heart. I'd love to make some heart blocks to help, if you're still willing to take them! Hi Megan. Are you still collecting blocks? My quilt group is interested in making some. Thanks, Lois A.